One of the biggest practicing tips I give my students is to practice with a metronome. Now this advice may seem over used or even slightly bland, but if used correctly, practicing with a metronome can produce incredible results for your playing! For jazz musicians, practicing with a metronome is especially important. The challenges a metronome forces us to address play a HUGE part in achieving improvisational freedom and soloing with rhythmic confidence. Tempo and Time. These two elements are crucial, not only because jazz music demands control of these things at a high level, but because without them your music will always feel a little bit off. Tempo is what I find many musicians use a metronome for, and is the most basic function it serves. Most often it’s used to practice playing faster tempos as those tend to be a big challenge. In other words, a metronome is commonly used as a tool to help musicians build chops and improve technique. This is certainly part of it, but it’s not the whole picture! To practice tempo with a metronome, we obviously can boil it down to varying levels of slow and fast. I suppose it’s not rocket science! I find that many musicians tend to skip over practicing slow speeds more often than fast speeds. However, in my opinion, slow speeds can be the most challenging! Think ballads. Have you ever played tunes like Stella by Starlight or Body and Soul at brutally slow tempos? Not so easy is it, especially when it comes to soloing! Practicing slow tempos actually bleeds more into the time aspect of practicing with a metronome than practicing fast. It really forces you to feel where the time is and where the rhythms lay within it. Start at more of walking ballad tempo like 90 bpm, and slowly inch your way down to see how slow you can go. Remember, when you are practicing it’s okay to go to an extreme. You may not actually perform the song that way, but being able to play drastically slow will improve your time feel and your ability to hear different rhythms within that time. Try practicing songs slow that you wouldn’t normally play slow. Turn a song like Cherokee into a ballad. I guarantee it will cause you to hear that song differently and approach it differently. This is the one that a lot of us tend to focus on. Jazz, more so than many other styles, forces us to confront very quick tempos. 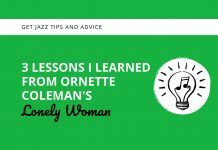 For me personally, I’ve tanked on fast tempo tunes many a time at a jam session or gig, and immediately went home to practice with my metronome! You’ll find the concept of practicing fast tempos similar to slow tempos. Start off the particular tune you are practicing at a medium tempo, say 140 bpm. Slowly inch your way up in speed. Try to find the particular tempo that is your cut off point; the speed that defines your limitations. Once you have established that, work towards slowly raising the bar. Try practicing some ballads at fast tempos. For example, I like to play Darn That Dream at an up tempo. Again, this will help you approach these songs differently and present new challenges for you to work on. This is where practicing with a metronome gets really interesting to me. Not only does a metronome help you build chops and play at different tempos, it can help build your sense of musical time. Of all the things that stop us from achieving musical freedom, bad time is at the top of the list! I’m talking about building that internal clock inside of you that allows your sense of time to be more accurate and stable. I have some very specific ways that you can achieve this. First off, in my opinion, the default should be practicing with your metronome on beats 2 and 4. I believe these beats help you to feel the strong beats (1 and 3) on your own. Also, if you are playing swing, this can be especially conducive to that particular feel. When I practice different tempos, I usually default by putting the metronome on beats 2 and 4. That being said, there are a lot of useful ways to practice with a metronome. The basic: start by putting the click on every beat. Pick a tune to practice and start at a medium, comfortable tempo. Have the metronome clicking on beats 1-2-3-4 and make sure you are playing the melody and improvising comfortably inside those beats. Only beats 2 and 4. Set the click for beats 2-4 and make sure you can play the melody and improvise comfortably inside those beats without turning them around. Only beats 1 and 3. Set the click for beats 1-3 and make sure you can play the melody and improvise comfortably inside those beats without turning them around. Only beat 1. Make the click represent only beat one (you may have to change the tempo on your metronome for this, while maintain the same tempo feel you had before). Make sure you are able to play the melody and improvise comfortably without switching the beat. This is where it really starts to test your inner time feel! Only beat 2. Be able to play the melody and improvise comfortably while keeping the click on beat 2 of every measure. Only beat 3. Be able to play the melody and improvise comfortably while keeping the click on beat 3 of every measure. Only beat 4. Be able to play the melody and improvise comfortably while keeping the click on beat 3 of every measure. Only 1 beat of every other measure (for the daring only!). This one is quite a challenge but definitely something to build up to. Try switching your metronome click so that it represents 1 beat of every other measure (one measure of no click). If you can nail this, you are really building up a great sense of time! Start on beat 1, and if you can get that, try the others as well. 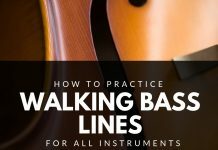 Practice all of these at different tempos and you’ve got yourself a lifetime of practicing ahead of you! A great online metronome to use is this Tempo Trainer. It has a lot of flexibility and allows you to set numbers of beats per bar, and even bars not to play clicks. 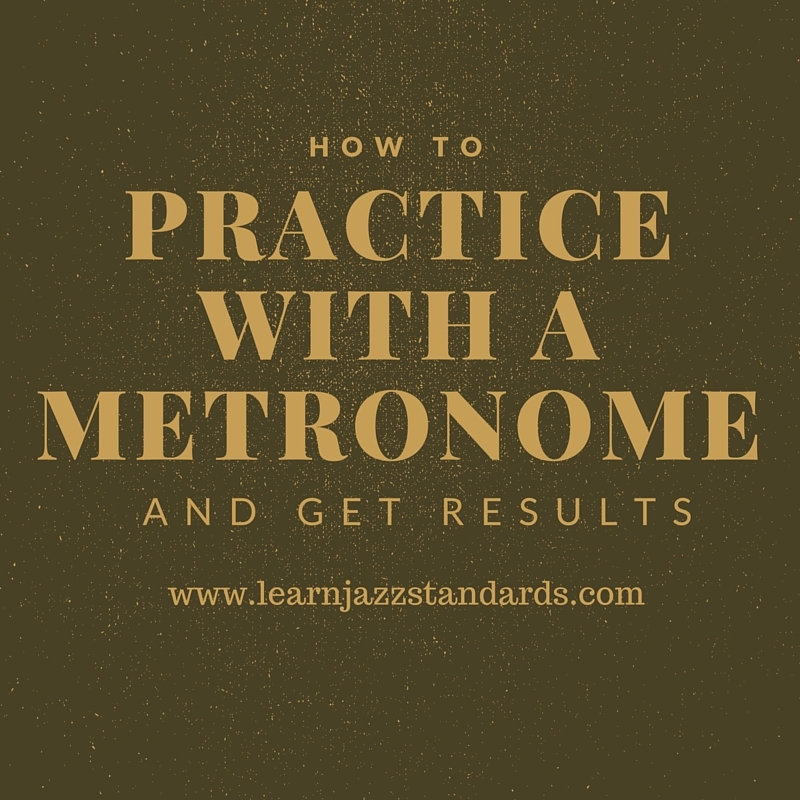 If you aren’t practicing with a metronome, start now. I guarantee you will be glad you did! How do you practice with a metronome? Leave your comments below. For me – late starter to playing music, let alone sax, jazz etc. – I realised after a while that, as well as time and tempo, there is a third thing to develop. Stamina. I think there's a bit of the brain that needs to be built up to be able to pay attention to an external rhythm while playing, reliablely, for a whole piece. It was a bit confusing, for me, because the difference in difficulty between, say 80bpm and 120bpm was less then between two bars, two lines and two pages! After a lot of frustration with backing tracks and metranomes (loosing the plot after a few bars), I concluded that really the thing to do – for someone like me – is treat it like training for physical activity; to build up, systematically​ over time, the number of bars I can play while still paying attention to the clicks/rhythm. I vary the tempo, syncopation, use different etudes etc. But only try for a bar or two more than I'm comfortable with before stopping, resting and starting again. Worth noting, also, that between the metranome and backing tracks / real people, many cheep electronic pianos will produce a range of backing rhythms which can be added into a stamina building regimen. Sorry that's a bit long, but I kinda wanted to get that off my chest. Much of the training / teaching materials ignores this. I'd guess because someone who has been playing for years takes their attention brain muscles for pretty much for granted. Thanks for sharing! You certainly are hitting on something here. It is indeed a muscle that needs to be exercised. Great article! Thanks for sharing 🙂 I've been using this metronome that I purchased from http://www.tempibrand.com and it really helped a lot!